Like coins, most comet have both heads and tails. Occasionally, during a close passage of the Sun, a comet’s head will be greatly diminished yet still retain a classic cometary outline. Rarely are we left with nothing but a tail. How eerie it looks. Like a feather plucked from some cosmic deity floating down from the sky. Welcome to C/2015 D1 SOHO, the comet that almost didn’t make it. It was discovered on Feb. 18 by Thai amateur astronomer and writer Worachate Boonplod from the comfort of his office while examining photographs taken with the coronagraph on the orbiting Solar and Heliospheric Observatory (SOHO). A coronagraph blocks the fantastically bright Sun with an opaque disk, allowing researchers to study the solar corona as well as the space near the Sun. Boonplod regularly examines real-time SOHO images for comets and has a knack for spotting them; in 2014 alone he discovered or co-discovered 35 comets without so much as putting on a coat. Most of them belong to a group called Kreutz sungrazers, the remains of a much larger comet that broke to pieces in the distant past. The vast majority of the sungrazers fritter away to nothing as they’re pounded by the Sun’s gravity and vaporize in its heat. D1 SOHO turned out to be something different – a non-group comet belonging to neither the Kreutz family nor any other known family. After a perilously close journey only 2.6 million miles from the Sun’s 10,000° surface, D1 SOHO somehow emerged with two thumbs up en route to the evening sky. After an orbit was determined, we published a sky map here at Universe Today encouraging observers to see if and when the comet might first become visible. Although it was last seen at around magnitude +4.5 on Feb. 21 by SOHO, hopes were high the comet might remain bright enough to see with amateur telescopes. On Wednesday evening Feb. 25, Justin Cowart, a geologist and amateur astronomer from Alto Pass, Illinois figured he’d have a crack at it. Cowart didn’t have much hope after hearing the news that the comet may very well have crumbled apart after the manner of that most famous of disintegrators, Comet ISON . ISON fragmented even before perihelion in late 2013, leaving behind an expanding cloud of exceedingly faint dust. Cowart sent the picture off to astronomer Karl Battams, who maintains the Sungrazer Project website, for his opinion. Battams was optimistic but felt additional confirmation was necessary. Meanwhile, comet observer José Chambo got involved in the discussion and plotted D1’s position on a star atlas (in the blinking photo above) based on a recent orbit calculation. Bingo! The fuzzy streak in Justin’s photo matched the predicted position, making it the first ground-based observation of the new visitor. Comet D1 SOHO’s orbit is steeply inclined (70°) to the Earth’s orbit. After rounding the Sun, it turned sharply north and now rises higher in the western sky with each passing night for northern hemisphere skywatchers. Pity that the Moon has been a harsh mistress, washing out the sky just as the comet is beginning to gain altitude. These less-than-ideal circumstances haven’t prevented other astrophotographers from capturing the rare sight of a tailless comet. On Feb. 2, Jost Jahn of Amrum, Germany took an even clearer image, confirming Cowart’s results. To date, there have been no visual observations of D1 SOHO made with binoculars or telescopes, so it’s difficult to say exactly how bright it is. Perhaps magnitude +10? Low altitude, twilight and moonlight as well as the comet’s diffuse appearance have conspired to make it a lofty challenge. That will change soon. Once the Moon begins its departure from the evening sky on March 6-7, a window of darkness will open. Fortuitously, D1 SOHO will be even higher up and set well after twilight ends. I’m as eager as many of you are to train my scope in its direction and bid both hello and farewell to a comet we’ll never see again. Here are fresh maps based on the most recent orbit published by the Minor Planet Center. Assuming you wait until after Full Moon, start looking for the comet in big binoculars or a moderate to large telescope right at the end of evening twilight when it’s highest in a dark sky. 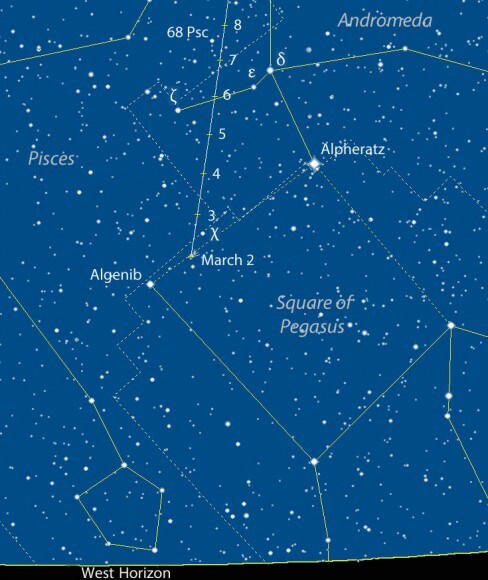 The comet sets two hours after the end of twilight on March 7th from the central U.S.